Viewers familiar with Austrian filmmaker Michael Haneke will know that, with Happy End, any hope of collecting on the title’s promise remains unlikely. Haneke has no interest in providing a sentimental or romanticized version of the world to his audience; he maintains the sort of realist perspective most often associated with pessimism. For instance, the film delves into, among its many themes, the well-treaded dangers and isolation of social media. While The Social Network (2010) and Disconnect (2012) already covered such material to near perfection, Haneke’s sobering, some might call bleak perspective considers the broader implications of seeing everything through the lens of a smartphone video or connecting with other human beings through Facebook Messenger. The more you feel that humanity is using social media to its detriment, the more you will enjoy Happy End. But the film’s reach doesn’t end there. Social media is just a symptom of the disconnection and self-absorption of the haute bourgeoisie, a class devoted to its own petty problems as, elsewhere in the world, and all around them, people suffer almost unnoticed. If all this sounds like a major bummer, you might be right. But that’s the world we live in, Haneke seems to say. After debuting at the 2017 Cannes Film Festival, the film received a lukewarm response, perhaps because Happy End seems very familiar. 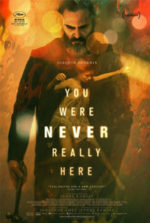 The film almost functions as a highlight reel of the director’s prevalent themes since his 2000 commentary on alienation and social downfalls, Code Unknown. His screenplay contains notes of his 2005 breakthrough Caché, in which unannounced surveillance provides a creepy edge to an assault on the suppressed guilt of the bourgeoisie. His strain of unnerving children, who are capable of horrific crimes that most adults would never suspect, continues from Caché and The White Ribbon (2009). The sadomasochistic love of his titular character in The Piano Teacher (2003) plays a small role in Happy End, whereas that film’s star, Isabelle Huppert, reprises her role from Haneke’s Oscar-winning Amour (2012), once again alongside Jean-Louis Trintignant as her father. 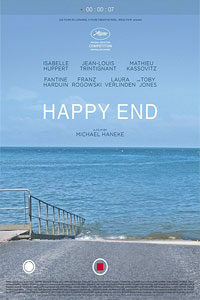 Haneke has described Happy End as a loose sequel to Amour, given the Huppert and Trintignant characters, not to mention the continued presence of euthanasia. The film opens with a video from a smartphone centered in the frame. The image captures a middle-aged woman in her nightly bathroom routine before bed, and the spectator comments on each intervallic action with text boxes. As we soon learn, the spy, icy preteen Eve (Fantine Harduin), records her divorcée mother with contempt. In the next scene, she tests her mother’s anti-depressants on her hampster. (Haneke’s films have never been easy on animals, maybe because people are not easy on animals.) But the poisoning of her hampster is evidently just a test run, or so we assume after Eve’s mother ends up hospitalized and unresponsive from an overdose. Eve moves in with her surgeon father, Thomas Laurent (Mathieu Kassovitz), in her extended family’s lofty estate in Calais. And as her aloof and unaffected quality continues, we might suspect her of psychopathy until, gradually, the film reveals that Thomas has been cheating on his new wife with yet another woman, and Eve learns about the affair after reading a series of X-rated messages. Are Eve’s actions those of a monster, or merely a child trying to resolve her unemotional family’s dysfunction? The Laurent family lives in such luxury because of Eve’s aunt, Anne (Huppert), who runs the family’s construction business. She hopes to one day offload the business to her son, Pierre (Franz Ragowski), but he’s incurably saddled with a sense of guilt after an accident on a construction worksite results in a man’s death. 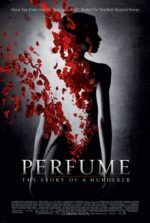 Though Pierre tries to make amends, his mother refuses to allow him to admit culpability to protect the company’s future sale. Pierre deals with his devastating shame through alcohol, refusing to show up to work, and karaoke (his performance of the Sia song “Chandelier” is both the film’s funniest and saddest moment). Meanwhile, on the periphery, Eve’s grandfather Georges (Trintignant) grows senile and, having witnessed the effects of dementia on his wife, whom he suffocated to save in Amour, wishes the same for himself. Happy End concludes with a hilarious scene designed to disrupt liberal elitism (though darker than most films, the approach is light for Haneke), followed by a disquieting moment of uneasy dread. Formally, Haneke exercises his usual, unflinching control. Watching one of his films is real work in the most rewarding ways possible. His technique requires an active viewer willing to consider what is onscreen, the method of its presentation, and the potential reasons why such details are significant to the narrative. His scenes do not flow into one another seamlessly; they act like self-contained vignettes, often delivered in a single, long, unbroken shot. He also avoids easy transitions or visual bridges. His cutting is intentionally abrupt and stark, and each new scene often requires a moment to acclimatize and determine what we’re seeing. Sometimes he cuts to a video within the diegesis but does not tell the audience until several minutes into the scene, a tactic employed both here, in a high-energy YouTube sequence, and in Caché. The viewer must fill in the blanks to determine the passage of time or how one scene relates to the next. And the lack of a non-diegetic score adds to the pensive quality and severity of his films, enhancing the thematic weight through long passages of silence. Which is all to say, Happy End is not a pleasant experience, but it’s a rich one upon close examination. The talented cast performs well in their director’s spare, internal style—Huppert, Trintignant, and Harduin above all (Toby Jones also appears as Anne’s lover and secret business partner). Though, the film could be accused of being too short or having too many characters for Haneke’s efficient style to accommodate. But the degree to which Haneke borrows from his own work, thematically and formally, remains at once essential and meaningless. As an auteur, Haneke has an established set of aesthetic and thematic conditions that he’s used without variation since his years in television. Certainly, there are parallels to his other work here, but those connections prove significant; they’re what make this un film de Michael Haneke. Even so, his observations in Happy End have each been made elsewhere in, frankly, better films by this director. But how many other filmmakers could achieve the caliber of even Haneke’s lesser work?